While Russia’s ties with South Korea are of great economic significance, Moscow’s uneasy relations with Pyongyang carry strategic geopolitical importance. Russia has learned well the lesson of the 1990s; without intensive dialogue with the North, it is marginalized in Korean affairs. Therefore, Moscow started to implement the doctrine of “standing on both legs” on the Korean peninsula since the early 2000s and established basic agreements between President Putin and Kim Jong Il that continue to bear fruit today. For instance, the issues of solving the debt problem, trilateral projects and logistics development can all be found in the 2000 and 2001 summit declarations. This process stagnated because of the North’s nuclear tests—when Russia reluctantly joined international sanctions—but was reinvigorated by the Dmitry Medvedev-Kim Jong Il summit in 2011 (symbolically the last meeting with a foreign head of state for the late North Korean leader). After Kim’s death in December 2011, and when the transition of power was on track in Pyongyang, serious, if non-public, negotiations on several major economic projects and political consultations between the DPRK and Russia started, notably initiated by North Korea. The most obvious reason for North Korea to reach out to Russia is to move away from overdependence on China, which is often accused of “semi-colonizing” Pyongyang’s economy. North Koreans have made a point of giving Russian businessmen “better terms” than their Chinese counterparts—a demonstration of displeasure to the Chinese as it tries to profit from playing the two most important friendly partners against each other (a lesson learned from Kim Il Sung’s “balancing” practice). Russia and China both understand this tactic well. Regrettably, due to the deterioration of Russia’s relations with the West, the political discourse in Moscow has shifted. Communists and National Patriots, traditionally friendly to North Korea, have suddenly become much closer to the mainstream. Their basic concept of Russia as the eternal object of Western hostility coupled with empathy from North Korean “anti-imperialist” and anti-American rhetoric for a continuing Cold War, led to an obvious conclusion to “close ranks” with North Korea in containing “US aggression” in the Far East. Accordingly, North Korea has become a household “horror story” for progressives who are accusing Putin’s government of “moving in the direction of North Korea,” that is, taking such measures as information closeness, self-imposed isolation, import substitution, intolerance to opposition and political and media control. North Koreans, I suspect, may take such propaganda at face value and consider that Russia is becoming a “natural ally” of their regime. During my recent trip to Pyongyang, I had several conversations with high-ranking North Korean officials who expressed sympathy towards Russia being pressured by the US and the European Union. They disagreed with the Western version of events in Ukraine and even offered moral support and advice on how to deal with sanctions against Russia. It is also true that the attitude towards the DPRK in the Russian corridors of power has become more lenient, while Russian businesses, devoid of access to Western markets, are looking for investment opportunities in hitherto neglected locations, including the North. There has also been an upsurge in political contacts between Russia and the DPRK in 2014. Pyongyang was shrewd enough to send its nominal head of state, Kim Young Nam, to the opening ceremony of the Sochi Olympics even though North Korean athletes were not present. This move was especially conspicuous given the absence of high-level South Korean representatives (the incoming host of the 2018 Winter Olympics), which many Russians believe was due to US pressure. Kim met President Putin for more than just a photo-op. Afterwards, political contacts intensified. Russian regional leaders, including the influential Tartar Republic President, Rustam Minnikhanov, as well as other high-ranking officials, flew to Pyongyang in spring/summer 2014. In October, the new DPRK foreign Minister, Ri Su Yong, undertook an unprecedented 10-day visit to Russia. He stressed that, “our relations are cast in blood,” and expressed support for Moscow’s policy in the Ukranian crisis. Bilateral economic cooperation was high on the agenda, with special attention to the Rajin transit terminal project, the success of which, as was stressed by the Russian side (and not opposed by North Korea), required the participation of South Korea. The situation in Northeast Asia was also discussed, including the Russian-Chinese Initiative on regional architecture as well as the Korean nuclear program, on which the positions diverged. The restart of the Six Party Talks was high on the agenda. Russian Foreign Minister Sergey Lavrov said that the situation is complicated, but not hopeless, although “too much confrontation was brought into the situation,” indirectly blaming all the opponents of the talks. The Russian side also stressed the inadmissibility of “abrupt steps,” warning North Korea against any provocations. Apart from Lavrov—with whom Ri established a good personal rapport, showing himself as an authoritative and reasonable figure—the DPRK Foreign Minister met with Russia’s Minister for Agriculture Nikolai Fyodorov, Deputy Prime Minister and Presidential Envoy for the Far Eastern Region, Yuri Trutnev, and the governors of the Far Eastern regions. The journey to four Far Eastern provinces stressed Ri’s preoccupation with economic cooperation. Unlike his predecessors, he reached agreements with local authorities, for example, on developing long-term bilateral agricultural projects. Russia, at the same time, made a gesture of transferring more than 20,000 tons of humanitarian food aid (wheat) to the North Korean port of Nampo as part of a larger package of 50,000 tons expected to be delivered before the end of 2014. However, Ri noted that North Korea does not want aid, but mutually beneficial projects, to become the backbone of relations. In another political gesture, North Korea and Russia celebrated the 66th anniversary of the establishment of diplomatic relations between the two countries (while the similar date with China was neglected) in late October. Those present at the reception in the DPRK Embassy in Moscow, were headed by Council of Federation (the upper Parliamentary chamber) First Vice-Speaker Alexander Torshin, who recently visited North Korea. All who attended can testify that the level of friendliness was unprecedented in past decades. However, unlike in the past, economic cooperation between North Korea and Russia is supposed to be based on the principle of mutual benefit and has preceded political rapprochement. The road to increased cooperation was opened by the implementation this year of an agreement reached in 2012 to reschedule the $11 billion debt North Korea owes to Russia from Soviet times. This agreement legally de-blocked economic ties between the two countries, while stipulating that the $1 billion the DPRK is obliged to repay be put in a special account that will be used to finance Russian investment in humanitarian and energy projects in North Korea. Moreover, according to the agreement reached earlier this year in April, bilateral transactions will be carried out in Russian rubles. The first transactions under this arrangement took place in October, as two North Korean banks, including the Foreign Trade bank, (sanctioned by the US in March 2013 and later for a period of time by China) opened ruble accounts and the Russian Regional Development Bank was nominated for bilateral settlements. The Rajin-Khasan railroad project, agreed to in 2008, has so far been the largest single foreign investment project in North Korea (about $340 million). The transportation of coal started in summer 2014 and the first symbolic direct shipment of coal to Pohang in South Korea via this route is supposed to take place before the year’s end. The basic Russian approach to economic cooperation is not to repeat the mistakes of Soviet times, when the North Koreans were allowed to repeatedly fail to deliver on their contracted commitments. Relevant Chinese experience is also taken into account and the feasibility of joint projects is now based not on North Korean promises, but on calculations of their ability to pay. The “money first” principle seems to now prevail. For example, the exports of minerals such as coal, polymetallic ores, and rare earths are the guarantees of investment. Russian businesses also rely on the support of state. The Russian Minister for Far Eastern Development, Alexander Galushka—a dynamic young bureaucrat who seems to take the success of projects in DPRK as a personal challenge—has held many practical negotiations with his North Korean counterparts as co-chairman of the inter-governmental economic commission (the latest round in Pyongyang a few weeks ago). Under the framework of the Rajin-Khasan project, the construction of an additional terminal in North Korea’s Rajin port, the modernization of the mineral industry, the initiation of automobile and energy projects by a Russian mining company, the access to direct road connections and mutual visits by local citizens, as well as the increase of border ties are all projects under discussion. The parties have also agreed on the establishment of the Russia-DPRK Business Council, which will unite businessmen who are looking to develop contacts. Russian businessmen recently accompanied Galushka to the Kaesong Industrial Complex (where they want to invest) and the prospective Chongjin free economic zone. The prospective plan is to modernize North Korean railroads—3500 kilometers or half the railroad grid—and also build new roads around Pyongyang. The first project in this grandiose 10-stage effort is to modernize the section of the Jaedong-Kangdong-Nampho railway. 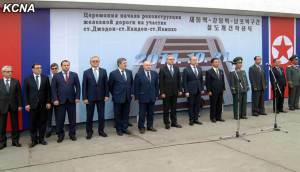 The groundbreaking took place at the East Pyongyang Railway Station on October 21. The investment involved to date is a far cry from the overall amount announced publicly. According to the company’s plans, it will start exporting metallurgical coal in 2015 (with the future potential to reach tens of millions of tons, with everything going to third countries, such as China). Of course, Russians know through decades of experience how difficult a partner North Korea can be. Sudden moves like virtually closing the country to keep out Ebola can ruin any modern business undertaking, making such measures as talk about visa-free exchanges of businessmen a bit premature. However, the greatest problem for the success of these projects is financing. Independent loans will be hard to find. The answer may be South Korea. Trilateral projects have long been the backbone of Russia’s economic strategy towards the North, which, first and foremost, is designed to involve Russia economically—and as a consequence, politically—in Northeast Asia. Secondly, such projects (especially in the energy sector) can help improve Russia’s competitive edge in East Asian markets. Thirdly, they can promote understanding between South and North Korea, contributing to peace and stability in Russia’s neighborhood. Finally, these projects can lead to marketization and the opening-up of the North Korean economy, in turn creating new possible areas of Russian-North Korean cooperation. Hopefully, the possible restart of dialogue and cooperation between the two Koreas attempted earlier this autumn might help invigorate such projects. However, Russia is prepared to manage this problem independently if necessary, as it has done in case of Rajin-Khasan railway link. In the end, much will depend not on government role, but on the efforts of businessmen. А.В.Лукин. Поворот к Азии.Moscow, “Ves Mir” publishers, 2014, pp. 509-510.